Star Trek: Discovery takes place 10 years before the original series with the famous team of Captain Kirk, Mr. Spock, Scotty, Bones and the Enterprise. Set in the 24th century, Discovery’s mission is to uncover new lifeforms and worlds, but one officer will also discover herself in her travels among alien species both old and new. Because I am a fan of the Star Trek franchise (particularly The Next Generation, and with Mr. Data being my favorite fictional character ever), I patiently waited for months for the airing of Star Trek: Discovery. Little by little, CBS would reveal images here and there with the infamous theme music and it would feed my imagination. In these teasers, I would see the shape of the phaser, the delta badge of the Starfleet… and despite my expectations for the show, my hopes for the show began to decline. When I first learned of the possibility of the show having two captains, I was inevitably curious. 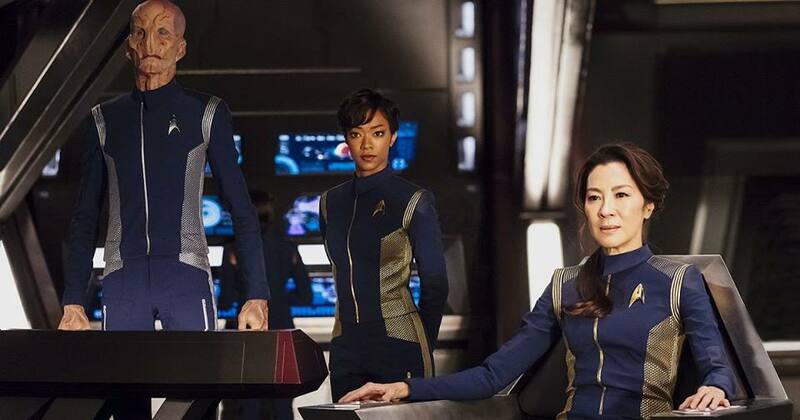 I especially wondered about the role of Lieutenant Commander Michael Burnham (Sonequa Martin-Green) in particular, because let’s face it, she IS the face of the series. Despite my ad-based sinking hopes, I was inclined to give the show a fair chance and watch the premiere. After all, I’d waited for so long for this to finally take place, I couldn’t see myself NOT glued to my screen on Sunday night. Simply put: it blew my mind. I watched both first episode premieres and I can say that overall, I was most excited about the storyline, special effects, the performance of the actors, the interactions between the characters and the setting. It is obvious the series will revolve around Lieutenant Commander Michael Burnham (who, as a canon reminder, is Spock’s adopted human sister) following the death of her parents at the hands of Klingons on her home planet of Vulcan. Lt. Cmdr. Burnham is also first officer on-board the USS Shenzhou under Captain Philippa Georgiou (Michelle Yeoh). Capt. Georgiou taught Michael when Ambassador Sarek (James Frain) first brought her on board seven years before. Philippa taught Michael the ways of the Starfleet and ultimately trained her to become captain of a starship, which grew ever more important to Michael. Captain Georgiou calls Lt. Cmdr. Burnham “Number One” a few times, which instantly brought me back to Star Trek: The Next Generation and Captain Picard’s relationship with Commander Riker, as it was, after all, his nickname, too. At first, I found it somewhat bold for the writers to have chosen that specific nickname, but instead, it grew on me the second time Capt. Georgiou referred to Commander Burnham as Number One. I even began smiling at the reference, which almost seemed like a tribute to the previous success of TNG. The relationship between Captain Georgiou and Commander Burnham could’ve been a failure from the beginning. Why? For the simple reason that it could have been seen as a replay of the previous friendship between Captain Janeway and Seven Of Nine (i.e. the emotionless Borg trying to find her individuality/humanity through the duties of a Starfleet crew while also still keeping some of her knowledge and strength the Borg had given her). This past friendship may be a little bit reminiscent of what is happening in the show with Lt. Cmdr. Burnham’s humanity (in regards to being raised Vulcan), but with the help of Captain Georgiou, she has obviously advanced her human emotional attributes while under the Captain’s guidance. However, the main focus of their relationship revolves around the trust both characters have for one another. This trust is quickly put to the test when Lt. Cmdr. Burnham suggests the investigation of an organic body that appears to be hiding among space debris as detected by the science officer on the Shenzou. Lt. Cmdr. Burnham ignores Lt. Saru (Doug Jones)’s worries about leaving the ship to investigate, but Captain Georgiou agrees with her Number One and grants her the right to wear the spacesuit and go on a solo mission to examine the organic body. 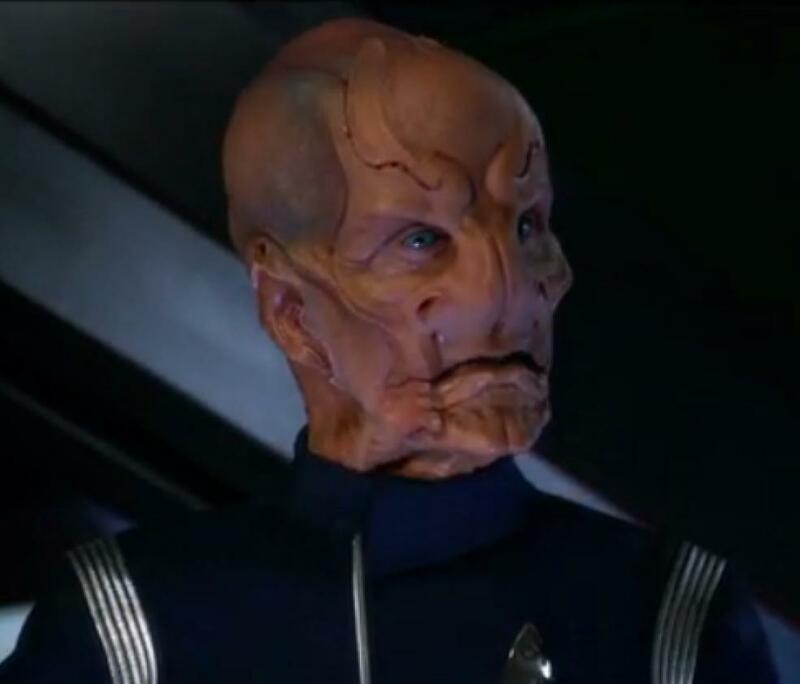 Lt. Saru is part of a new species Star Trek: Discovery is bringing to life named the Kelpiens. In the first episode, Saru explains that his species were biologically bred to sense the coming of death. He reveals this information when Commander Burnham reports that she was attacked by a Klingon while investigating the semi-organic body (which turns out to be a very unique Klingon spaceship). Lt. Saru is thus far poised to be the Mr. Spock and/or Mr. Data of this new installment of the Star Trek and will almost most certainly and swiftly become a beloved character. He is highly lovable, and I have to admit, even like a more subtle version of Dr. Sheldon Cooper of the The Big Bang Theory. When the Klingons are first shown, I was particularly impressed by the direction the creative team took, despite not liking the overall look. I personally felt the show went a little to “ape” for my taste, but I do admire the risk they took to go in a different direction and make the species appear a little more impressive, yet simultaneously slightly more “mean” looking. 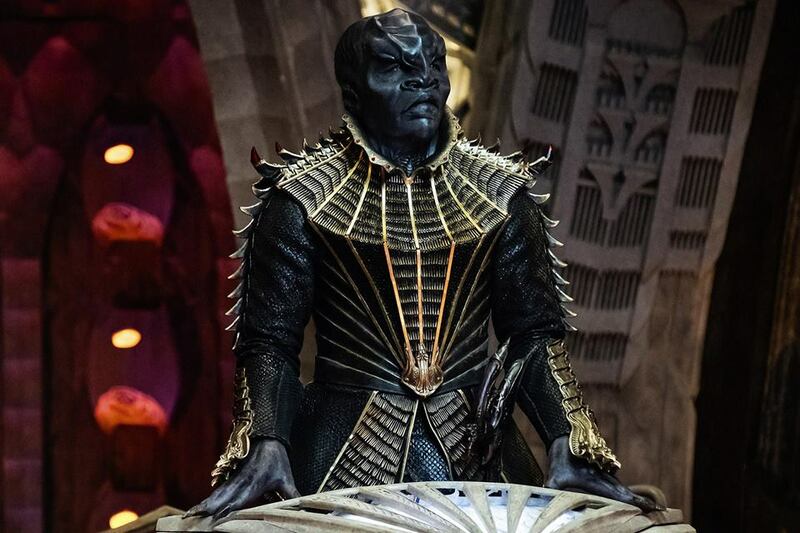 The new look feels like the result of inspiration from Star Trek: The Next Generation mixed with the new J.J. Abrams reboot of Star Trek of the original series as well as Star Trek: Discovery’s own vision of what the Klingons should be. So far as Klingons go, I also admired the strong, constant use of the Klingon language. Also fascinating was the incorporation of one of Klingon who appears and is indicated to be the equivalent of albino, and who was also orphaned and rejected by his own kin. This new Klingon, Voq (Javid Iqbal) walks forward in the council, claims the right to be the leader Kol (Kenneth Mitchell)’s new right hand man, and states that he will unite the Houses of the Klingon Empire. Voq says he will help bring the Empire back to glory by standing up against, mostly, Starfleet. He also vows to keep the blood of the Klingon race pure and unmixed with other alien species. As might be guessed by the dialog and intentions stated by various Klingons, the Klingons will almost certainly be the main villains of the series. Michael’s discovery of the Klingon ship is reported as soon as humanly (Vulcanly?) possible to the Captain, despite that being in the midst of Michael’s obvious escape from sickbay. This is the first taste of suspicion and what may be a precursor for the season. It’s freely discussed among the crew multiple times that Starfleet hasn’t seen the Klingons for decades, so when Lt. Cmdr. Burnham insists that it is a Klingon spaceship covered in tombs of their ancestors, Captain Georgiou chooses to believe her. Lt. Cmdr. Burnham leaves the bridge to ask for Sarek’s council on how to defeat the Klingons, or at least keep them at bay. The resolution presented by Sarek seems most unorthodox and when brought to the Captain by her Number One, Capt. Georgiou denies the request, despite Lt. Cmdr. Burnham’s relentless persistence that lack of Sarek’s suggested engagement (essentially, strike before they strike and they will respect/disengage), will end in a treacherous cascade of unwanted actions. The battle scene between Starfleet’s fleet and the Klingons’ is stunningly impressive and makes obvious that Star Trek: Discovery wanted to reveal the impressive quality of their CGI and graphics. The overall look of the inside of the starship was very up-to-date and cutting-edge, as well. Overall, I felt it clear that some ideas were inspired from the BSG reboot. What do I mean by that? Well, for the very first time, a Star Trek series will be one long chapter instead of individual sixty-minute stories. Thus, most likely, it will also be more intensely dramatic. What about the standard idea of “when you think it will get better, it only gets worse” sort of thing? My suggestion: give it a chance. I do understand why some die-hard Star Trek fans didn’t enjoy the first two-hour premiere of the show, including that the introduction theme and imagery were different from what we’re used to. I also understand the frustration at a lack of familiarity between the characters, but remember the first season of TNG? It might take another two or three episodes, notably because of the ending of the premiere. Give it time. I’m confident we’ll all appreciate the unification of the new team as it unfolds on-board among the Starfleet. 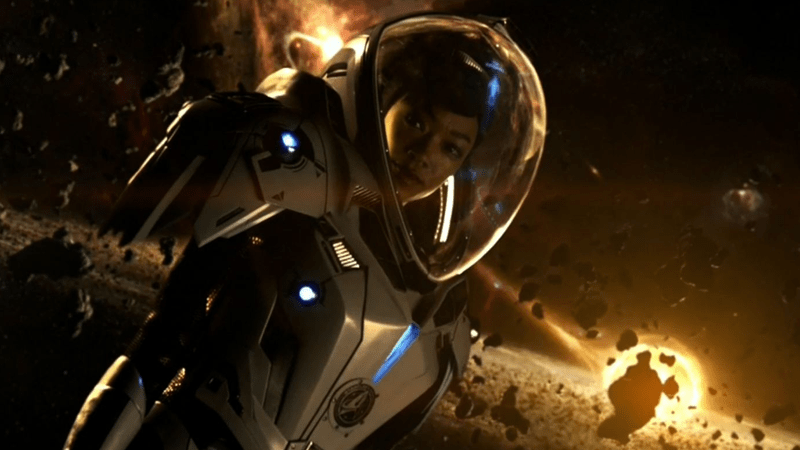 Star Trek: Discovery may become a love or hate series, but to me, it is a new breath for the Star Trek franchise and I am willing to see where this adventure will take me.